Mary Lou McDonald suggested that someone should buy Priti Patel a history book. A CONSERVATIVE MP’s suggestion that the UK government should use potential food shortages in Ireland as leverage against the backstop has been strongly rebuked by Sinn Féin. A government report, leaked to the Times of London, indicated that Ireland could face worse food shortages than Britain in the event of a no-deal Brexit. Former UK Secretary of State for International Development Priti Patel told the paper that these warnings should have been used to encourage the EU to scrap the backstop customs arrangement. “This paper appears to show the government were well aware Ireland will face significant issues in a no-deal scenario,” Patel reportedly said. Why hasn’t this point been pressed home during negotiations? There is still time to go back to Brussels and get a better deal. 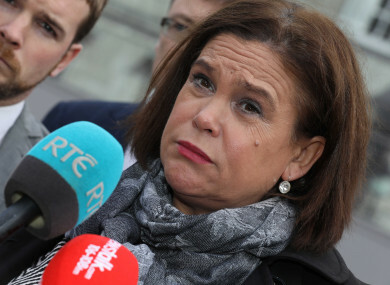 Speaking to journalists outside Leinster House this afternoon Sinn Féin leader Mary Lou McDonald quipped that someone should buy the MP a history book about events in 19th century Ireland. “I think that statement was, for obvious historical reasons, very distasteful and insensitive and gauche. It also belies, really, a very reckless and almost juvenile mentality,” McDonald said. British parliamentarians are, of course, entitled to take their position and to plough their democratic furrow. They’re not entitled to wreck Ireland. And they need to really grasp and understand that and we will stand firm in defending Irish interests and we’re not about to be bullied and we’re not about to be threatened by that MP or any other. “I would hope that she would reconsider those comments and actually withdraw them from the public record; not least I think they make her look silly and intemperate,” she concluded. Sinn Féin’s Northern Ireland leader, Michelle O’Neill, repeated McDonald’s calls for Patel to withdraw the remarks and labelled them “ridiculous” and “disgraceful”. “We’re not going to stand idly by and allow Priti Patel or any of the Brexiteers to treat Ireland in such a disgraceful manner. We’ll stand up for Irish interests. We’ll stand up for the people, for prosperity, for jobs, for the future and we’re not about to sit back and tolerate that type of language,” she said. The backstop, which guarantees that there will be no hard border on the island of Ireland, has rankled Brexiteers because it could lock the UK into an indefinite customs arrangement that would stop them striking new trade deals with other countries. Email “Sinn Féin blasts 'reckless' Tory MP's suggestion to use food shortages in Ireland as leverage against backstop”. Feedback on “Sinn Féin blasts 'reckless' Tory MP's suggestion to use food shortages in Ireland as leverage against backstop”.